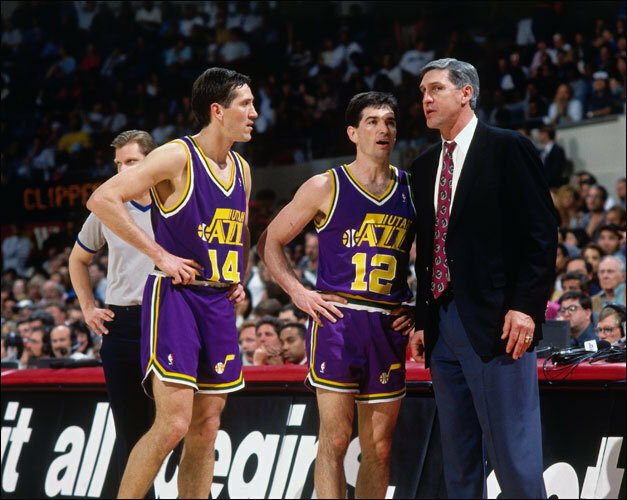 Payton entered the NBA in 1990 and would face Stockton in 70 regular season and postseason games prior to Stockton’s retirement in 2003. In their head-to-head matchups, Stockton owns the edge in assists, shooting efficiency, and wins while Payton has the edge in scoring and rebounding. The Jazz faced the Supersonics four times in the postseason, with both teams winning two series each. In their first two playoff series matchups Stockton was clearly the superior player -although Seattle had superior talent in ’93. In ’96, the teams were fairly equal which was indicative in their 7-game series. Payton consistently outplayed Stockton throughout, although Stock played much of the ’96 playoffs with elbow, hamstring and groin injuries that severely hindered his effectiveness. Their 2000 playoff series featured Gary Payton coming off arguably his best season as a pro (24.2/8.9/6.5) while Stockton was still ticking along (12.1/8.6 – 50%/36%/86%) although clearly past his prime at age 37. Nevertheless, the series still treated basketball fans to an epic point guard dual as the 7th-seeded Sonics pushed the 2nd-seeded Jazz to 5 games (in a best-of-5 series). Payton opened the series with a 24/11/6 line that was overshadowed (along with Stockton’s 10&10) by Karl Malone’s 50-point eruption. In Game 2, Stockton put up 21 points and 11 assists on a ridiculous 9-11 shooting while playing just 30 minutes. Back in Seattle the Sonics evened up the series behind Payton’s 23/10/7 in Game 3 and then a masterful 35/11/10 in Game 4 that featured plenty of emotional fireworks as well as a heated war of words with Karl Malone. Back in Utah for the fifth and deciding game, both players rose to the occasion with physical defense and vintage offensive performances. Stockton racked up 17 points, 15 assists, and 7 rebounds on 6-9 shooting while Payton went off for 27 points, 9 assists and 6 rebounds on 12-25 shooting. The series ended when an ice-cold Chuck Person (who spent the entire series on the bench) was inserted into the game by Paul Westphal in the final seconds and missed a potential game-tying three off a pick&pop with Payton. It was difficult to find two point guards who had a bigger contrast in styles to their games. 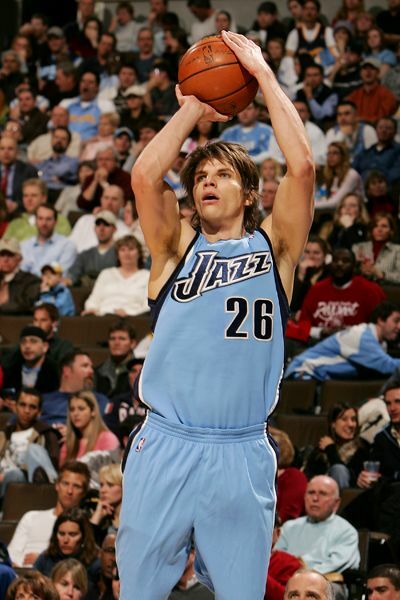 Stockton was a methodical, fundamental pass-first point guard who was an incredibly efficient shooter and the best screen-roll point guard in the league has ever seen. Payton was an in-your-face on-ball defender who could score from all over the court, developed himself into a potent 3pt-shooter, was a sneaky-good rebounder and one of the better post-up point guards in the game. While Stockton never engaged in a war of words, Payton was known for his brash trash-talk. Despite their differences, the two point guards who own a combined 19 all-star appearances had one simple thing in common: both were fierce competitors who came to win every single night. Even in the twilight of Stockton’s career, the two future hall-of-famers went after it, refusing to take a possession off. Beyond their incredible talent, perhaps most impressive was both players’ durability. From 1990-2003 Payton and Stockton’s teams would meet 73 times – and in only 3 of those games did either Payton or Stockton sit out due to injury (Payton missed 2, Stock missed 1). To this day, both players remain two of the most durable players to ever play their position. In his 17 year NBA career, Payton missed just 27 games – with 14 of those coming in 2005-06 (his final season). “The Glove” would notch 10 regular seasons in which he played in every game. Similarly, in his 19 year NBA career Stockton would miss just 22 games (with 18 of those coming in the 1997-98 season) and would play an incredible 17 regular seasons without missing a single game. What made Gary Payton and John Stockton’s 13-year rivalry so special was the way they competed at both ends of the court. It was competitive, physical, emotional – and best of all it was pure with winning as the only objective. There have been a lot of talented point guards to enter the league since, but there hasn’t been a point guard duel that has exceeded the battles those two had. On Sunday they’ll no longer be competing, but it’ll be refreshing to see them both on center stage again.